The search bar is anchored at the top of the screen and replaces the action or title bar. It contains 3 elements: a text field for letting users type in search terms, a search button on the right to start the search, and an optional pop-up selector on the left, for selecting a search mode. Presence of the pop-up selector is shown by an indicator pointing down. When the search bar is launched or activated, the text field is selected, and a cursor is displayed, indicating the user can start typing. Also the keyboard slides in from the bottom. 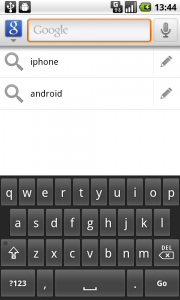 Together with launching the search bar and keyboard, a list of previous search terms related to the selected icon in the pop-up selector is displayed. Note that the terms have secondary information, next to the label. To switch search mode the icon for the pop-up selector is tapped. … opens the corresponding search mode. The text field is selected again. 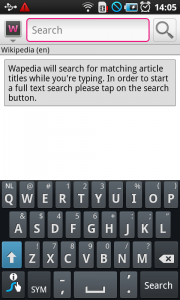 … or by tapping the enter-button, which usually displays the text ‘Search’, or ‘Done’. When the query has been made, the results are displayed in a list. The search bar has to be applied consistently for all searches, i.e. search bars at a fixed location on top of the screen, but also searches coming from a dedicated button in the action bar, a hard key, or an option in the option icon menu. They should all work alike. Use a dedicated search bar at the top of the screen if searching for relevant items from a lot of content within the app will be used often by the user. 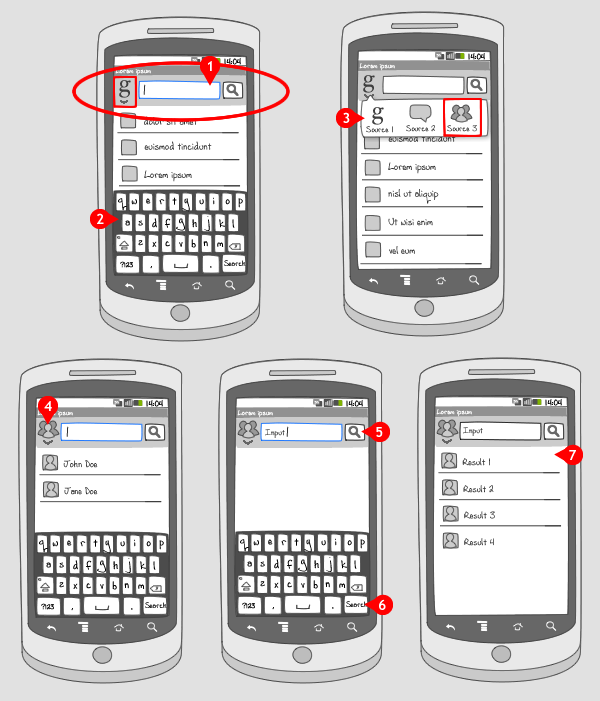 It is not so obvious that multiple search modes are offered. The user has to notice the indicator. 2 As soon as the user starts typing, the button for voice input changes into the regular search button, and suggestions are shown. 3 In the pop-up selector of google search, the user can add or discard searchable items, by tapping the target in the top right corner of the pop-up. 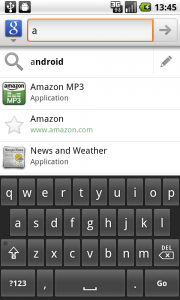 4 When the user selects to search the applications mode, only suggestions from installed applications are searched. 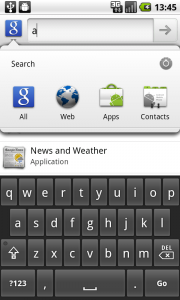 2 When the text field is tapped, the keyboard comes up. Under the pop up selector-icon a line of text shows which part of Wikipedia will be searched. 3 The search term is typed, and the results are shown. 4 When the icon is tapped, the pop up selector opens. 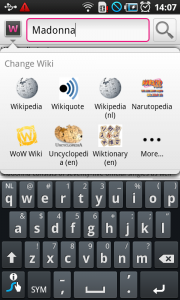 5 An other Wiki is selected, the pop up selector closes, and the results change.